Very soon I will leave the warmth of the Sunshine State to head north, bracing myself for the vicissitudes of late winter in March. Fortunately my destination is Gettysburg, Pennsylvania —that compelling beacon to Civil War-era scholars. 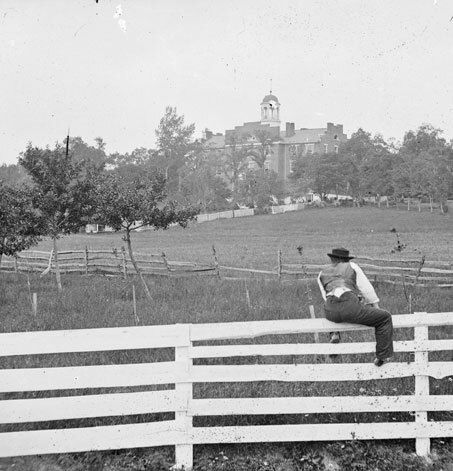 Gettysburg College, Gettysburg National Military Park, and the Gettysburg Foundation are hosting an innovative, and sure to be exciting conference on “The Future of Civil War History: Looking Beyond the 150th”; more information is available at http://www.cwfuture150.com/. I am fortunate to be on the conference program moderating a session on battlefield rehabilitation, which has prompted some reflections on both my panel and Civil War-era studies more generally. Each year millions of Americans flock to Civil War battlefields to learn more about the soldiers who fought there and to read about the events that occurred there. Most important to many, perhaps, is simply being on hallowed ground. Battlefields have a magnetic appeal that is almost mystical. It is important to ask, however, what do we see when we visit these sites? During the war years the actions of Union and Confederate armies altered natural and built environments. After the cannons quieted veterans continued impacting the grounds upon which they had once fought constructing monuments, creating roads, and building structures. The National Park Service—stewards of much of this sacred soil—has continually rethought historical interpretation. And, as I’m learning through my panelists’ work, visitors’ understandings of wartime landscapes is key to battlefield interpretation. Although many parks now explicitly explain changing landscapes through panels and signs, visitors may still be unaware that sections of Gettysburg or Fredericksburg, for instance, included rehabilitated landscapes. The National Park Service defines rehabilitation “as the act or process of making possible a compatible use for a property through repair, alterations, and additions while preserving those portions or features which convey its historical, cultural, or architectural values.” Most often, rehabilitation is employed to develop a fuller interpretive experience for visitors—in effect, trying to take them back to a lost moment in time. These efforts can include: converting an asphalt road into a dirt surface; the removal or addition of vegetation or trees to better show nineteenth-century topographical features; the use of vegetation or tree-lines to mask modern intrusions. The ultimate goal is to advance the interpretive possibilities of a battlefield. As many professors, public historians, and professionals readily recognize, rarely can a book or an article speak so eloquently as actually being there. Topography, geography, landscapes, and/or built features suggest the limitless teaching moments that visitors can encounter or public historians can prompt when visiting a battlefield. This particular issue was put in stark relief for me personally several years back. I interned with the National Park Service at Fredericksburg during the final phases of site rehabilitation in and around the Confederate position along the stonewall. That space, which now includes a dirt roadbed, an augmented stonewall, and other features performs an invaluable interpretive service. I can remember as a child walking down a broken, paved road and sensing disconnect between the nineteenth-century battlefield experience I wanted to be part of and the twentieth-century intrusions. Sometimes these intrusions augment the experience creating historical layers, but at a site that contends with so much urban expansion and for a roadway that seemed so unnecessary, the Park’s decision to reconstruct the dirt roadway seems commendable. In this sense, then, battlefield rehabilitation is an invaluable part of an institution’s teaching mission. It is also useful to think about what is being lost in the process of battlefield rehabilitation—another theme of my panel. For instance, a debate rages currently about the future of the Cyclorama Building at Gettysburg. Constructed in the early 1960s, the structure is a significant element of the battlefield’s commemorative landscape. Overlooking ground near the Union line’s center, the Park Service “is tearing down the building in hopes of returning the landscape to its 1863 aesthetic” according to a newspaper article. Some historic preservationists might question this decision insisting upon the building’s architectural significance and positing its importance to the battlefield’s longer history. As such, this particular story has prompted me to wonder if we can reach a middle ground, or must one model of representation and interpretation trump all others? If so, what is the vision that wins out and why? “The Future of Civil War History” is creating a vibrant forum for the discussion and debate of this crucial epoch in American history. Academics such as myself, public historians, preservationists, professionals, and scores of others will gather to talk and think about how we remember, how we write about, and how we interpret the American Civil War through scholarship and public history, at museums, and on the web. All of this suggests that the study of the Civil War-era is anything but moribund. Recently, historian Stephen Berry led a forum on the future of Civil War-era studies and scholars isolated several vibrant subfields that suggest lines of future inquiry: “nationalism studies; the environmental history of the war; the history of race; the study of Northern civilians, especially African-American women; the fading notion that there even was a Confederate home front; military history; and the emerging field of capitalism and slavery.” Anyone wondering is there anything left to study need look no further. This very blog has affirmed assessments that we have yet much to learn from one of America’s bloodiest conflicts. As I cruise up the highway cutting through the Carolinas and winding through Virginia I’ll have a lot on my mind. As is probably true for many of you, I started my journey as a Civil War scholar at a tender age. Now, decades later and with a child of own I relish the opportunity to show him a battlefield that meant and means so much to me, and to meet some of the people who share our passions. “Archaeology and Historic Preservation: Secretary of the Interior’s Standards and Guidelines,” as found at http://www.nps.gov/history/local-law/arch_stnds_10.htm [accessed, 26 February 2013]. “Protestors: Keep Cyclorama Building,” 25 February 2013, as found at http://www.ydr.com/local/ci_22660474/protestors-keep-cyclorama [accessed, 26 February 2013]. Stephen Berry, “Predictions,” The Journal of the Civil War Era, vol. 2, no. 1 (March 2012): 3. This entry was posted in Civil War Events, National Park Service, Ties to the War, Upcoming Events and tagged Battle of Gettysburg, Civil War Future, Gettysburg, Gettysburg College, Gettysburg National Military Park. Bookmark the permalink. Hi Chris, something to think about, and bring up in your discussion; and, since you are sensitive to natural resources, you would be able to understand my point of view, is the restoration of battlefield landscapes on a broad scale. I think the reconstruction of the Sunken Road is an awesome example of a great idea put into practice – however, what concerns me is the wholesale removal of forested areas, like what is/was being done at Gettysburg. This has a huge impact on wildlife, plants and wetlands – and, thinking specifically at Gettysburg, removing the visual buffers right up to people’s suburban backyards – that one was a huge mistake in my mind. I understand the importance of recreating a visual battlefield, but when huge swaths of forest are removed – chunks of forest that have been there for several decades, and have become high-value wildlife habitat in those intervening years – that is a problem. The NPS is supposed to preserve and protect – not slash and burn. If the appearance of an opening can be recreated in a considered manner with a scalpel vs. a broad headed axe the agency would be on a road to compromise. Also, the idea of removing forested wetlands – again, a high value ecotype – for an open field wetland, one not near as valuable for wildlife is a travesty. And, when I refer to the impacts on wildlife – I do think of charismatic megafauna like deer, but, almost more importantly, the small, seemingly insignificant wildlife, like small mammals, amphibians and reptiles, and small herbaceous plants. Forest clearing and forested wetland clearing has a HUGE impact on these small critters, that are suffering major impacts throughout their range. Deer can move around to different areas, but these small critters usually just get killed, they are too small to escape. Birds too can be impacted – they can fly away, but they have nesting needs – some need large areas of intact forest to successfully nest – these large tracts are getting harder and harder to find. Just something to ponder, and possibly bring up during your panel discussion.